Come and CELEBRATE with The Beginners Bible as they have been around for 25 years! You can get your own ideas to celebrate The Beginner's Bible by having your own party. Their website has so many great tools from party invites, to coloring printables, to snack ideas! To celebrate my kids and I colored the placemats, made bracelets, and made some salt dough keepsakes! My daughter also got to take one of her "Beginner's Bible" to kids camp. Happy 25th birthday "The Beginner's Bible!" The first activity we did was print a few of the placemats off of "The Beginner's Bible." M daughter picked the picture that went along with Jonah and the big fish and she was able to tell me the story. My son picked the Noah's Ark story and as you can see we are still beginners at coloring... I am trying to get him to hold any writing utensil the correct way rather then a grasp. After coloring we used pipe cleaners to string on some beads to make a bracelet. Titus kept his Noah's Ark theme as he used animal and ark beads in his. My daughter loved all the bright colored beads that matched the WWJD cross beads. On to making a pretend cake with salt dough. My kids each wanted to make a cake with the salt dough and then use some beads to decorate it. I have to say they were very creative and had a lot of fun! Salt Dough Recipe: 1 part salt, flour, and water. Add some food coloring and knead till good texture for play. I on the other hand decided to make some fun faces! 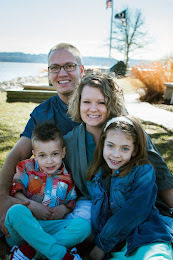 The kids and I had a fun time celebrating and plan to do similar activities with our kids church over the next couple weeks. I highly encourage you to check out all the fun activities that The Beginner's Bible has on their website! This Bible comes with individual DVD movies for each story. 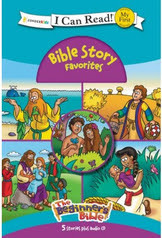 I love using these stories in my Sunday School classroom to showcase a story more! Kids love visuals and this is vital to helping them understand the stories more! 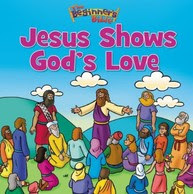 Introduce preschool children to the stories and characters of the Bible with this best-loved Bible storybook, now available in a Collector’s Edition. 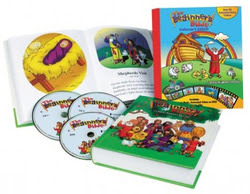 Children will engage with the Bible like never before as they read the book, listen to the audio, and watch the stories come alive in individual animated story videos. With more than 90 Bibles stories included, children will delight in Noah helping the elephant onto the ark, Jonah praying inside the fish, and more, as they discover The Beginner’s Biblejust like millions of children before. My seven year old has claimed this Bible as her new one. She loves the bigger font and she took this one to camp with her! It is NIrV so it is easier for her to read and comprehend. We have started to use this Bible to help her do her daily devotions. We use the SOAP method which stands for Scripture, observation, application, prayer. 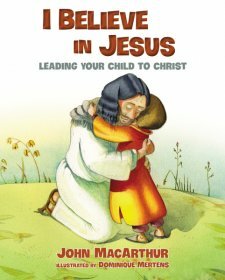 This book showcases Jesus life and helps young readers understand how much God loves them! 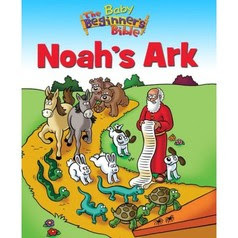 Noah’s Ark, based on the bestselling storybook Bible of all time, is part of the Baby Beginner’s Bible board book series that helps parents encourage even their youngest children to experience the Bible through colorful illustrations and simple words. I enjoy board books for the younger ones and this one is a great introduction to experience the favorite stories of the Bible. This book is one I am going to hang onto and make copies to use for our kids program at church. There are so many activities that will go along with many different themes that we might discuss! I love this 5 story collection with the CD to listen. Beginning readers will love listening to the story as they follow along which is a huge skill that many schools use to help increase reading abilities. The five stories are top favorites among many kids! One lucky winner will win all 6 books mentioned above! Please enter the giveaway using the easy rafflecopter from below. I am so excited for one person to get all these great resources to help your child grow more and more in love with Daddy God! Thank you Zondervan for sponsoring this giveaway! I did receive these books in exchange for writing my review and holding a celebration or the 25th birthday of "The Beginner's Bible." I had a great time and all opinions are 100% mine. 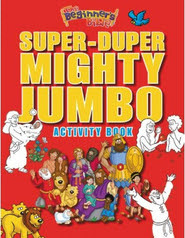 I would love to win The Beginners Bible for ages 4 and up. 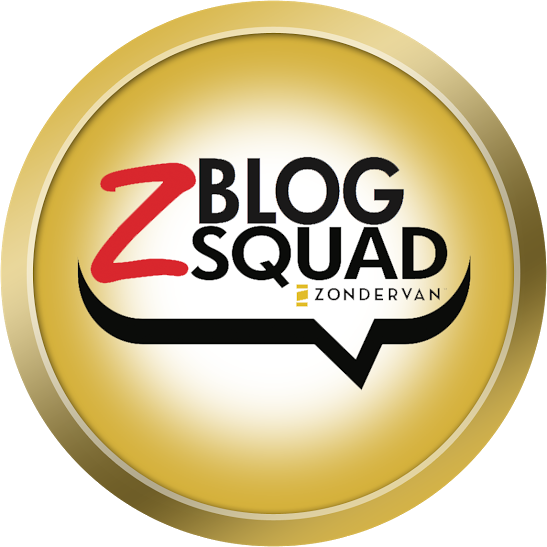 This is one of the best giveaways out in the blog world , at least to me." Teach up your Child" Is a constant reminder daily to me on my frig from Sunday school. No only my children but my husband and I since we are children of God, and still have so many lessons to learn. Thank you for us a great giveaway with such a wide selection of books. I'm excited about all of it! I am so grateful to have won this giveaway! It is an awesome set! Thanks again!